Rey: Let's find something scary to watch on TV. Rey: *Channel Surfing* Ano ba yan, Halloween night wala man lang nakakatakot na movies sa cable TV?! Rey: Ayan, CNN na lang, nakakatakot ang nangyayari sa Euro. 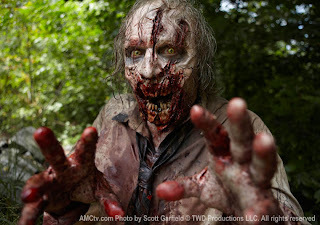 Oh well, we didn't get our scare fix this Halloween, but hopefully we get to watch the current "Walking Dead" Season 2. Haha.